With millions of Internet users sharing copyrighted content every day, some entertainment companies have embarked on campaigns to shakedown alleged infringers with settlement demands. The process is broadly the same wherever it takes place in the world, with anti-piracy outfits sitting in BitTorrent swarms and logging the IP addresses of connections alleged to have downloaded and/or shared content without permission. This evidence is then presented to local courts which invariably order ISPs to hand over the personal details of alleged infringers. To compile this data, Bahnhof obtained copies of all disclosure applications and subsequent court decisions from the Patent and Market Court. Unlike the current position in the US, each application can cover huge numbers of IP addresses. In 2016, there were 13 applications for personal data, i.e the names and addresses of alleged infringers. 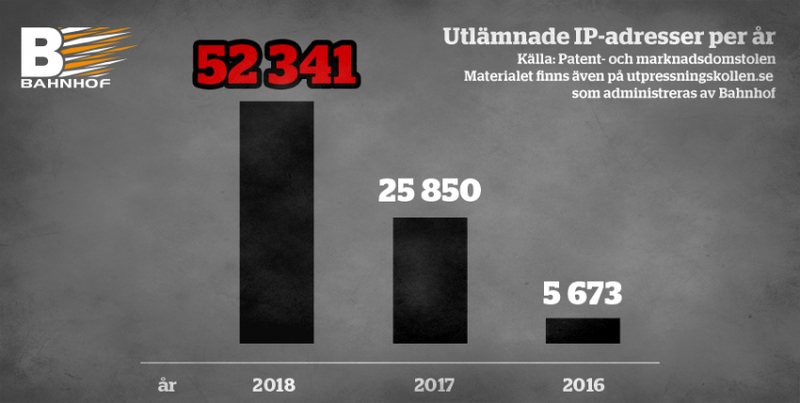 In 2017, that figure had grown to 27 but in 2018 there were 72, a clear sign that copyright trolls now view Sweden as a favorable country to conduct their business. This is underlined when more closely comparing the trolling activity in Sweden with that of the United States. As detailed in an earlier TorrentFreak report, more than 3,300 new cases were filed against alleged BitTorrent users in the US during 2018, with most targeting a single user per case. The United States has a population of more than 328 million while Sweden has ‘just’ 10 million. In the US, most of this activity can be attributed to two adult industry companies – Malibu Media and Strike 3 Holdings. In Sweden there are various rightsholders with three law firms carrying out the threats – Njord Law (32 cases), Ramberg Advokater (28), and Engström & Hellman Advokatbyrå (2). Interestingly, the trolls and their associated law firms in Sweden appear to favor four Internet service providers when making their applications. Statistically, customers of telecoms giant Telia are the most likely to receive a settlement demand, with the court ordering the ISP to reveal the identities of subscribers behind 37,035 IP addresses in 2018. Customers of Com Hem fall in second place with 7,889 IP addresses, with Telenor closely following with 6,762. Rätt Internet Kapacitet i Sverige was placed in fourth with orders to disclose the identities of subscribers behind 571 IP addresses. Perhaps most notably, the court ordered Bahnhof to reveal the identities of exactly zero subscribers in 2018, but this is no accident. Bahnhof refuses to log the activities of its subscribers which means that when the trolls come calling, there is no useful information to hand over. Bahnhof CEO Jon Karlung says this is the model other ISPs in Sweden should also be operating. “The solution is simple. DONT STORE DATA about your customers! If you do not store any data, there is nothing to hand out,” he informs TorrentFreak. “I have read the fine prints from the bigger telcos – and they all say that they store data basically forever. They argue that this is because they need it for support issues. Well? Really, for years? “No, it is often mentioned that they store data for ‘Enhancing the customer experience’. I assume that most people don’t think that blackmail by copyright trolls is a nice ‘enhancement’. Bahnhof does not store data. We have handed out in zero cases,” he adds. 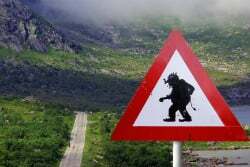 While statistics like those collected by Bahnhof and TF make for interesting reading, the personal stories of those affected by aggressive tactics of copyright trolls often go unreported. Karlung says he has personally spoken to many people targeted for cash settlements. “Some of them are elderly people saying that they have no knowledge at all about a specific movie. They seem genuine enough but since there have been no tests in court, it’s hard to say,” he says. The number of people who choose to settle following a threat is impossible to report accurately, since many who do so also agree not to speak about their agreements in public. In the UK it was previously estimated that somewhere between 10% and 20% pay up but Karlung believes that the number could be higher in Sweden. “Swedes tends to be trusting of the legal system. This is now being exploited by the trolls. They basically use blackmail as a modus operandi and there is no way the individual can protect themselves. Therefore I believe the payments are much higher here,” he concludes.